It’s bound to happen. Try as you might to protect your baby from germs, sooner or later they’ll win. A sick baby is no fun. As moms, we want to do everything that we can to help our baby feel better. But what can you do when your baby is sick for the first time? Unfortunately, when babies get sick, there aren’t many medicines available like with an older kid or adult. But, there are some simple things that you can do to help her feel better while the cold runs its course. Every time my baby gets sick, I swear that I will avoid germy places and sick kids like the plaque. Then you slowly forget. Being sick isn’t fun, but I would take it 100 times over having sick kids! As a nasty head cold just made its way through my household and with three clingy and grumpy little ones, all while I have a terrible sinus headache from the very same cold. 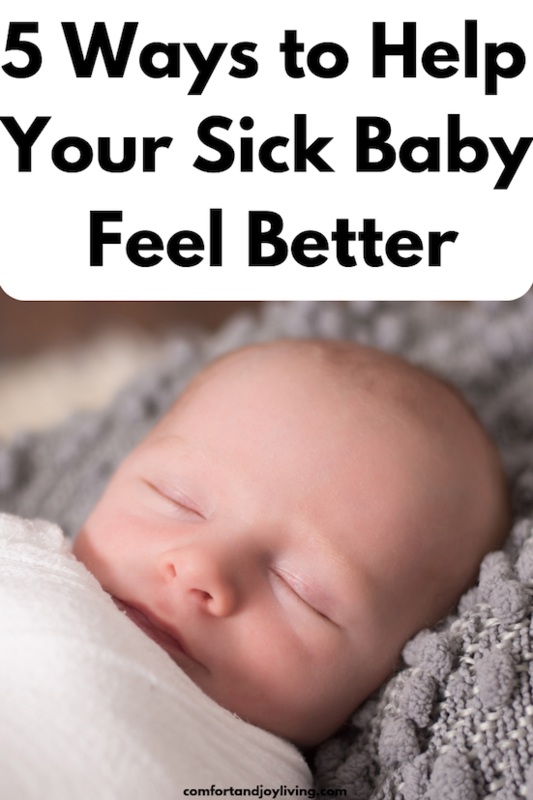 I decided to share my tips for soothing a sick baby for the other moms and dads out there that are going through this for the first couple of times and don’t know what they can do to help their baby that can’t tell you what’s wrong. Through the sicknesses of my own children, I think I have mastered a few ways to help babies get through a cold as best they can. Babies have very tiny little nasal passages and they can get clogged so easily. Even if you just cleared them out 20 minutes ago, you probably have to do it again. The traditional bulb suckers just don’t really get the job done. In my opinion, one of the most helpful products on the market is called Nose Frida. You use the suction power of your mouth to get the mucus out—don’t worry, it doesn’t get in your mouth. Try squirting some saline solution in your child’s nose to break up the thick stuff and make it come out more easily. No baby like it having it done, but when the can breath better, they they can eat and sleep better. It’s well worth it. 2. Keep the air humid. Try your best to keep the air humid in your baby’s room. It help break down the mucus. I love our cool mist humidifier. The water tank last through the night and helps keep the air moist. Which results into a baby that can breath better when they’re sleeping. 3. Try to keep your baby upright. When you lay your baby down flat to sleep, all that mucus just collects and makes it hard to breathe. sometimes, I let my baby nap on me in a baby carrier just o she can get some rest. For night time, if you have an older child, prop them up on pillows so they are at an incline to help the mucus keep moving. If you have a little one, this can be harder to find a way for safe sleep. I like to use our swing—I can bring the seat in our room at night—with the back adjusted all the way up. Our infant bucket car set or our rock n play work just as well. (None of these options are intended for all night sleep, so be sure to use them carefully as the manual suggests). 4. Give your baby a warm bath and massage. A warm bath can be soothing to your baby who may have aches and pains from their cold. And, the steam from the bath and the warm water can break up the mucus and help relax your baby. Just make sure to not make it too warm and consult with your doctor first if your baby has a fever. Follow the bath with an infant massage to help relax your baby. And of course offer lots of snuggles and cuddles before putting them to bed. 5. Use medicine when you think that they need it. Get approval from your doctor first. If your doctor has told you that it’s safe to use Tylenol (or whichever OTC medicine your doctor recommended), then by all means, if your baby seems like they need it, then give it to them. Sometimes, they may have an achy body, headache or earache, but they can’t tell you other than by crying or fussing. If you think they need it, then give it to them. Just use it safely and clear it with your doctor. Most pediatricians have a great nurse line that can answer questions for you 24 hours, so don’t hesitate to call. Give extra love and stay patient. Sick babies can use all the cuddles that they can get. They don’t understand what’s wrong with them and are counting on you to fix it. In the middle of a cry fest, I know it can be really hard to stay patient, but try to take a deep breath and remember that your baby needs you and your love. Feel free to go into another room and curse the child or place that got your baby sick. It may make you feel a little better. I am not a doctor, just a mom who’s been through many cods in my day! I like to use the Mayo Clinic’s guide to when to seek medical help. It’s a good point of reference. Also, don’t hesitate to call your pediatrician; part of their job is to help you take care of your baby. It’s perfectly okay to be the over-worried parent; your children are the most important people in your world, why wouldn’t you be overcautious? I do find that calling first can save you a visit to the doctor who would tel you to do your best to keep your baby comfortable and wait it out. If the doctor thinks your baby needs to come in and be seen, then the doctor will tell you. In the meantime, try your best to keep yourself and other family members healthy as best as you can. Remember that your baby will get better soon. Can you add any helpful tips? Disclaimer: We are not medical professionals and information shared on this blog should not be taken as medical advice. Always consult with your medical provider concerning any issues you have regarding you or your baby.